This week I'm going to hopefully take the fear out of English Paper Piecing curves! 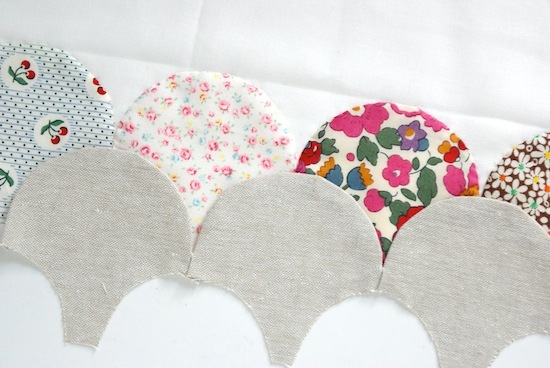 There are endless design opportunities to be had when using curved EPP shapes; they are ideal for appliquéing to a larger quilt design or using them in quilt borders. 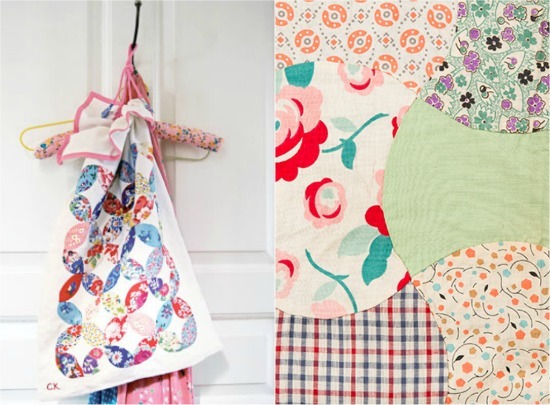 I'm particularly taken by this and this vintage clamshell quilts, so let's try and overcome this so called 'daunting' method so we can recreate beauties like those shall we!? Some of the popular curved EPP shapes include; clamshells, apple cores, Dresden's, circles and hearts - all of which feature one of more curved edges. 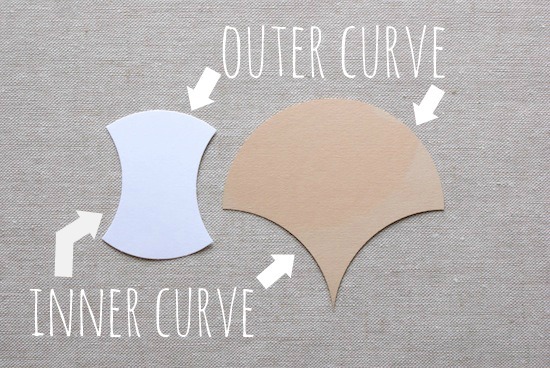 Today we're going to be looking at clamshells, which are a great shape to get started with if you haven't tried curves before - because they feature both inner and outer curves. Ok let's begin. So for this tutorial I'm using the Paper Pieces 3" clamshell shape. Start by cutting multiple squares that are roughly 1/4" bigger than your paper pieces template. Stack 4 layers together and cut around the shape leaving enough room for turning over. I'm going to show you the two main methods for basting curves, glueing and hand sewing. This is where the nifty little Sewline glue pen is a real timesaver! Place a dot of glue on the paper template and press onto the fabric to secure. Swipe your glue pen from one side of the outer curve. Swipe the glue halfway across the curve and begin pulling down the fabric - be firm when you turn the fabric over to avoid bumps and pleats showing through on the other side. Glue across the other half of the curve and pull down the remaining fabric. You will notice pleats to the back of the shape, this is fine - you need these to ease around the curved edge. Volia! A nice smooth curve, aaaaand you only need to baste the outer curve, how easy was that?! Grab a couple of paper clips to hold your template to the fabric in place. Take a length of thread, knot the end. Take a running stitch from one side of the outer curve - close the the edge of the fabric. Gently tug on the thread to pull the fabric over the template shape. Carry on sewing until you reach the other side and pull taut. Take a 3 or 4 stay stitches to secure. This method I find is a little fiddlier, but also gives good results. You may want to press the edge to help keep the seam flat. So once you have made enough clamshell shapes for your desired design (mine is going to be x5 wide). Take two, and place right sides together. Find the point at the side of the paper template - make sure they are both lined up precisely as this will make your sewing a lot easier down the line! Thread your needle, knot the end and take 3 very small stay stitches to join your shapes together, tie off. TIP: Join your points together in sets of two, it will be easier than a whole line of them, and will avoid over-handling them. Now we've done our first row of clamshells we want to add them to a background fabric. Cut a piece at least 1/2" wider on each side than your finished row and at least 1" wider on the top and bottom. Press the backing fabric in half lengthwise, this will be our measuring guide to line up the top of the clamshells. But first we have to remove the paper templates! To remove the paper templates, just give it a little tug and slide out. You can see above the traditional hand sewing method clamshells keep their shape perfectly, whereas the glue pen method are a little stretched - just give them those a little press with the iron. Take some quilting appliqué glue with a fine nozzle and dab some very small dots around the edge. Lay the clamshells to line up with the pressed line. With the next row I'm making a set of 4 clamshells because my first row was 5. (The next row will be 5 and then 4 and so on). Place some dots of glue on the back edge as we did before. Line up the row so they just cover the tacking stitches we did to join the shapes together. Make sure they are nice and straight to carry on neat rows all the way down. Applique this row and continue again until you have the finished size you need! See, not too difficult at all is it? I hope this helped you. See you next week for more English Paper Piecing fun! Hey thats awesome! I have always wondered if you had a foundation fabric under the whole thing or just the first row. Cant wait to see how to finish this. I may never actually make it but i love knowing how! Thanks! Thanks for this great tutorial! Very detailed. I love this! Thank you so much! You're like the quilting grandma I never had. :) I have always wanted to learn. I savo your posts!! Thanks Diane, yes it's not the finished article yet! To finish just carry on the rows down until you have enough for your design and trim the sides of the piece measuring out 1/4" from your shortest row (in my case the row of 4 clamshells). Best of luck with the sewing course! This is a super clear tutorial! I can understand your directions for both methods. Thank you for taking the time to explain this technique! Thank you so much! I'm looking forward to this block. I have done a little EPP with hexies and have an ongoing project I'm working on when we travel. I was wondering where we can get the template for the clamshell? Do you have a suggested website or source for the pieces? Thanks so much!